Over a kitchen table in 1969, in a small apartment in Los Angeles, two best friends were talking of forming their own gang. One that would become one of the most widely known and feared gangs of the modern era, the Crips. Only the three men in that room, the two founders, both now dead, and the youngest brother of one of them would ever know the true story of the name and the man, until now. 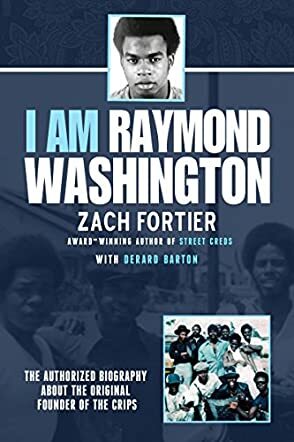 I Am Raymond Washington by Zach Fortier and Derard Barton is the story of growing up in the streets of Los Angeles, where it was common to get up every morning and walk a couple blocks to the corner where the local Black Panthers were giving out free breakfast to the kids. Raymond turned twelve the week of the Watts Riots, and was able to watch them from his apartment, although he is said to have been out in the violence. He would grow up seeing things that would be unbelievable to someone growing up in a different type of neighborhood, and it all influenced the formation of the Crips. Zach Fortier, with the help of Derard Barton, Raymond's younger brother, tells the story of Raymond's life in a non-judgmental way so as to give you a glimpse into the why and how, and let you, the reader, decide what is right, wrong and just somewhere in between. I Am Raymond Washington should be read by everyone, no matter what you know or feel about the Crips or gangs. I found historical incidents that occurred that would influence Raymond's views of the police, and that of all the residents of the Watts, Compton and South LA area that I had never even heard of before. Zach Fortier, as a former police officer involved in gang crime, admits in the writing that even he was shocked to learn of some of the behavior and incidents that occurred that would shape Raymond's views of the world. Derard Barton, Raymond's brother helping with the telling of this biography, lends a human side to Raymond, not just the tough, ruthless, powerful street thug leader of the notorious Crips. Even if this is something you never think you would read, pick it up, give it a chance; it might just enlighten you in a way you never imagined.